A DVD decoder for Windows Media Player is necessary if you like watching DVDs on your computer. It makes DVD watching much easier and there would be less playback problems. There are several Media Player DVD decoders out there that can help you play a DVD with Windows Media Player 10/11. But if you want to download a DVD decoder for Windows Media Player free, then you are in for disappointment because most of them are not free. Check out our recommendation of the top 5 Windows Media Player 11 DVD Decoders below. The first Windows media player 11 DVD decoder I’d like to introduce to you is Advanced Corel. The Advanced Corel DVD Decoders are a series of DVD coders that have different DVD decoding capabilities. The DVD Xpack delivers high-definition picture clarity and superior sound for DVD playback. It also brings hardware acceleration on NVIDIA, AMD and Intel to DVD playback. It’s perfectly compatible with NVIDIA GeForce 6 Series graphics processing units. Dolby Digital (AC-3) audio decoding is also supported. It also has the soundtrack adjustment capability which allows you to down-mixes 5.1 soundtracks to 2-channels to create the most suitable sound. Moreover, it works perfectly with Microsoft DirectShow and takes up less processing power of your CPU when playing DVD with the support of DirectX Video Acceleration. There are also other two decoder packs that come with wider support of hardware acceleration and video enhancement technology. The Roxio CinePlayer DVD Decoder developed specifically to help Windows users to play DVDs on Windows Media Player. It helps to deliver superior video quality without compromising system performance. It can play DVDs with full frame rate with no frame drops and in extraordinary clarity and detail. The advanced audio and video synchronization algorithm that comes with this codec can prevent video or audio lag during DVD playback. The K-Lite Codec Pack includes all the needed codec for you to decode and play basically all the video and audio files you can find out there, including DVDs. With this codec pack installed, you will have a lot of new features and functions. Some of the new features include: the ability to detect broken codec, new file association options, hardware acceleration for video decoding and playback, etc. The best part about this Windows Media Player 11 DVD decoder is the built-in video renderer that allows for high quality video upscaling. It can give you a clearer and better viewing experience with your old DVD movies. The Media Player Codec Pack enables you to play protected Blu-ray and DVD after having it installed in your computer. Other than giving your computer the ability to play physical media, it also allows you to play videos of various formats. 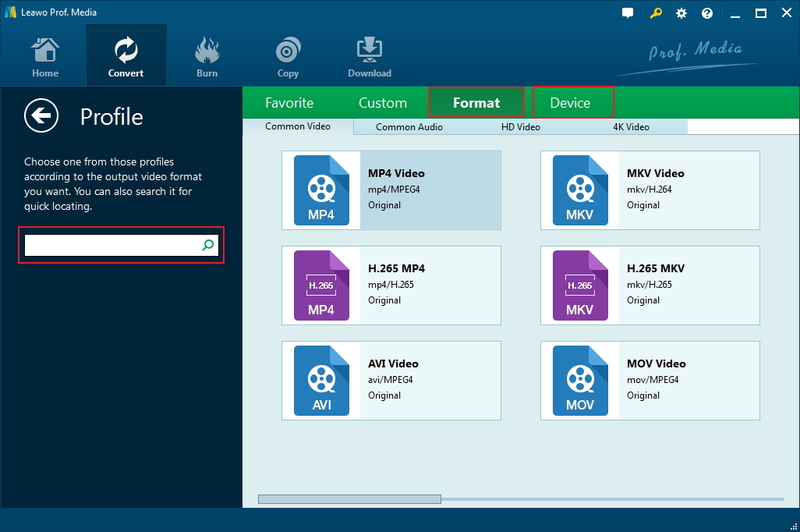 Popular video and audio formats like MKV, AVI, WEBM, MP4, M4V. AC3, DTS, FLAC, BDMV, OGG can all be played on your computer with no problem. If you are in need of a versatile media player DVD decoder to help you play DVDs, Media Player Codec Pack would be a great choice. It’s one of the best Windows Media Player 11 DVD decoders you can find. For a high quality Windows Media Player 11 DVD decoder, you might not want to miss Windows Media Codec Pack. Not only is it free, but it also works on all versions of Windows. It’s a Windows Media Player 11 DVD decoder for all versions of Windows Media Player. It helps you to play video and audio files in all kinds of popular formats including DVDs, MP4, Xvid and more. You can find a compatible DVD decoder for Windows Media Player from our recommendations above. One thing you should know about these Windows Media Player 11 DVD decoders is that they are not free. So if your plan is to install Windows Media Player DVD decoder free, then you would probably be disappointed. To play a DVD on Windows, a compatible DVD decoder for Windows Media Player is not your only option, you can actually consider having the DVD movie ripped to your computer. That’ll make watching the movie much easier for you. If you want to give this a shot, below is a program you can use to rip the DVD. When it comes to multimedia processing software, Leawo Software is a company you can look to for high quality options. Its Leawo DVD Ripper is one of the best options for DVD ripping. The first reason for choosing it is that it can rip protected DVDs. As most of the commercial DVDs out there are protected with copy protection, it really makes it hard for some DVD ripping tools like Handbrake to work properly. But it won’t be a problem for Leawo DVD Ripper as it has the DVD decrypting technology that allows you to rip all kinds of protected DVDs. Also, it provides you with a great number of output formats to convert the DVD movie into. Our recommendation for the most suitable output format for Windows Media Player is WMV as it’s natively supported by WMP. 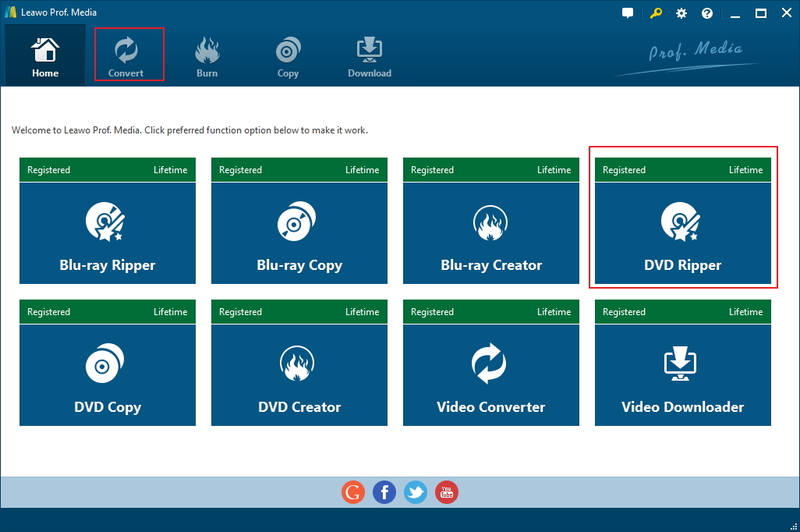 Below is how to use the program to rip DVD to WMV to play on Windows Media Player. Step 1. Download Leawo DVD Ripper from Leawo’s official site and install it on your computer. Since Leawo DVD Ripper is a part of a big software suite called Prof.Media, you would find the shortcut icon of Prof.Media on your computer. The button for loading Leawo DVD Ripper is right on the main interface of Prof.Media. Click on the DVD Ripper icon as you see it to launch DVD Ripper. Step 2. Enter the DVD disc in your optical drive and the program might need a few seconds to detect the disc. Afterwards, click the Add Blu-ray/DVD button and you will see a drop-down menu with 3 options. Click Add from CD-ROM and you will see the title of your DVD, click on this option to import the data in the DVD to Leawo DVD Ripper. Step 3. A typical DVD disc will contain more than just the movie in it. The following interface has a list on it which presents to you all the videos in the disc. What you need to do here is use one of the buttons provided above the list to select the videos you need for ripping later. Here’s what the 3 buttons are for. If you choose Full Movie, the program will later rip all the videos. If you choose Main Movie, then only the main movie in the disc will be ripped. You can also use Custom Mode to pick multiple videos from the list. Click OK after choosing a ripping mode and the videos you need. Step 4. The videos you’ve chosen to rip will be shown on the following page. Click the button on the left side of the green Convert button and a new menu would show up below the button. Click the Change button on it to open the Profile panel. All the output video and audio formats can be found here. You can find WMV in Format>Common Video. Step 5. After going back to the video list, click on the green Convert button in the upper-right and there will be a sidebar appearing from the right side. Set the output path for the output videos on the sidebar and start ripping the DVD movie to WMV by clicking the Convert button below. Other than having the DVD ripped, you can try a new way to play the DVD movie with Windows Media Player. Here’s how. Here’s the second way for you to enjoy a DVD movie on your computer with Windows Media Player without needing a Media Player DVD decoder. What we are doing here is copy the DVD folder to your hard drive first and then use a program called Avidemux to convert the video files in the DVD folder to WMV videos so that you can play them directly with Windows Media Player. Here’s how to do that. 1. 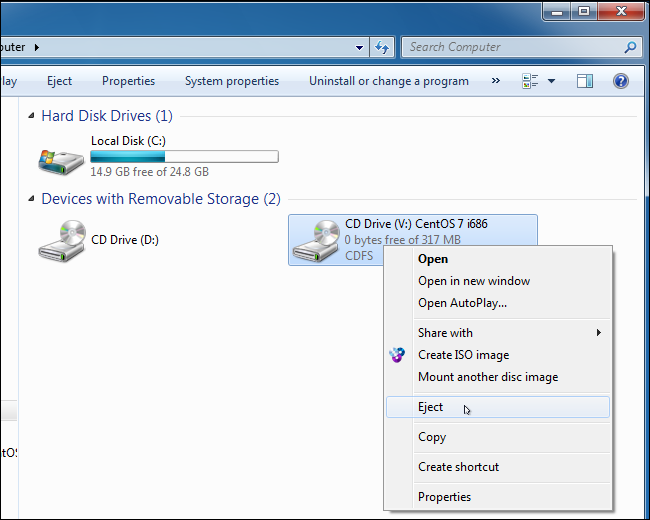 Insert the source DVD disc to your DVD drive and then right-click the DVD drive icon in Explorer. And then choose Copy on the pop-up menu to copy the DVD folder to your computer hard drive. 2. Open the DVD folder, find the VIDEO_TS folder and open it. You will see different types of files in it. What we need here are the VOB files in the folder. Usually the biggest VOB file is the main movie. Find the target VOB file. 3. Fire up Avidemux and drag the VOB file to its interface directly. 4. Click the button below Video Output to select video codec. 5. Click the button below Audio Output to select audio codec. 6. Click the button under Output Format and select WMV from the drop-down menu to set WMV as the default output format. 7. Click the Save button to set where to save the output video and enter file name for it. Afterwards the conversion will start automatically. WMP is the player offered by Windows for you to play DVDs, but it’s certainly not the best choice. If you don’t mind going a few extra miles, you can actually go find an alternative to WMP to have a better DVD watching experience. Below are 3 excellent choices for a WMP alternative. Leawo Blu-ray Player comes from Leawo Software, the same company that gives you Leawo DVD Ripper and Leawo DVD Copy. It’s a free and powerful video and audio player which can also play physical media like Blu-ray, DVD and CD. The best thing about it is that it’s completely free, even for Blu-ray playback. And it can even play protected Blu-ray/DVD discs. VLC is a famous open-source, cross-platform video player for users to play videos of different formats on different platforms. The Windows version of VLC can also play DVDs. And VLC is also free. 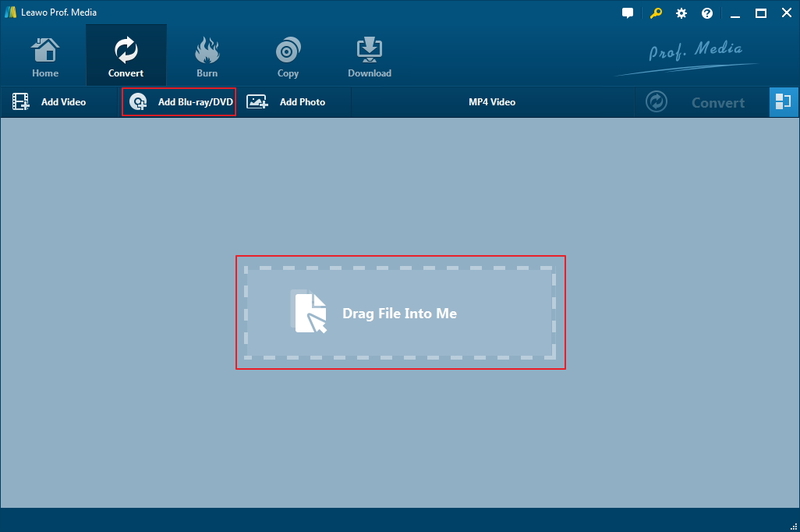 One thing you might not know is that you can even use it to rip a DVD and convert it to MP4. But the limitation of VLC is that it can’t play certain DVDs with copy protection and when situations like that come up, you will have to find a third-party library for VLC to decrypt and play the protected DVDs, which could be troublesome for certain users. 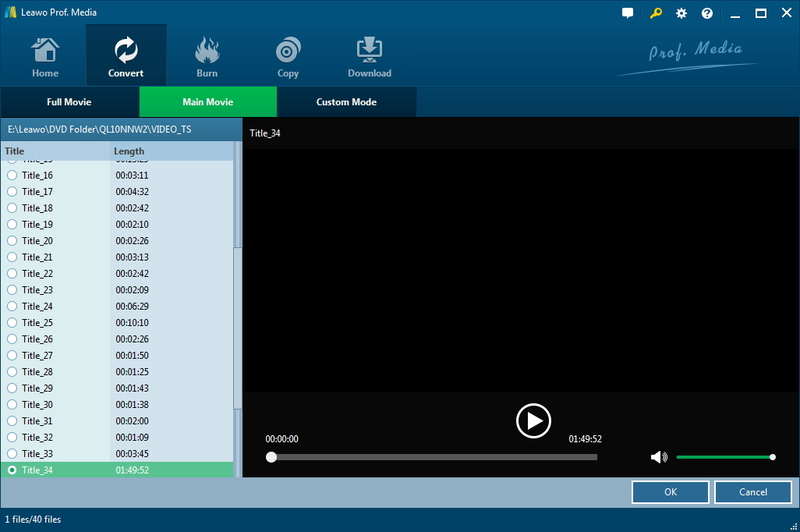 KM Player is well-known for being able to play most of the video and audio files on your computer. And it also supports playback of DVD discs. And just like the other two programs we recommended above, it’s completely free. You can use it to play a DVD disc without having to pay for it.